It frames World War I as a breaking point in which Assyrians betrayed and stabbed the country in the back by cooperating with the great powers like Russia. Moreover, it also focuses on recent sociological aspects of the community's relations with the state. The migration of Assyrians to Europe increased for economic reasons. But this fact is presented in the text from a negative standpoint in which Assyrians are instrumental elements for European political goals, manipulating them for Western interests in their relation with Turkey. The article quotes an Assyrian writer, who criticizes various aspects of the book, saying "the history of Assyrian people must be rewritten with the assistance of Assyrian scholars and by taking their opinions into account." An open protest letter signed by more than twenty organizations from Turkey and the Assyrian Diaspora, and addressed to the Turkish Education Ministry, says this kind of initiative is an example of how "distorted and defamatory information about the Assyrian Christians is aimed to plant hatred into the young generation's mindset" and create enmity between the various ethnic groups in Turkey. The letter also points to the fact that the language of the textbook "violates Article 26, clause 2 of the United Nation's Universal Declaration of Human Rights, which Turkey signed and which regards education as opportunity of the development of human personality and aimed at strengthening respect for human rights and fundamental freedom." Education should promote understanding, tolerance and friendship between nations, races and between religious communities, the letter says. The history textbook, however, is promoting "hatred rather than establishing peace and brotherhood," the letter concludes. The letter demands the textbook be withdrawn from the school curriculum because its claims about Assyrians are unfounded and based on lies. 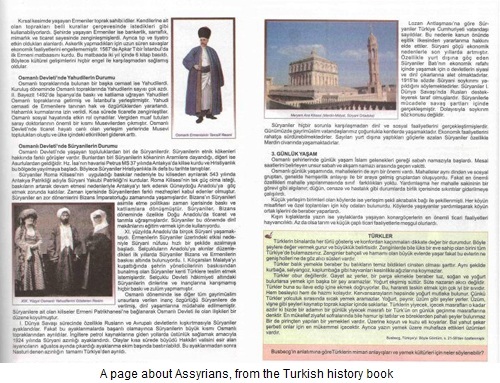 In another public appeal, fourteen Assyrian civil and religious organizations in Turkey, among them the Monastery of St. Gabriel, the Monastery of Hah, parish committees and many village associations of Tur Abdin in South-East Turkey, deny the claims raised in the book, saying that Assyrians have been "always loyal and honest to the country." The religious and cultural difference of Christians with the majority population is a historical reality and the government needs to promote mutual understanding and brotherhood among them. This is supported through a proper education, the appeal says. Assyrians have been supportive of Turkey's positive democratization steps along the process of becoming a full member in the European Union. However, Assyrians regard the constitutional changes only as initial steps towards that goal. What is important, they stress, is a change of mindset. Obviously the official Turkish attitude is still to "depict minorities as a potential danger," according to the appeal. The group demanded the withdrawal of the textbook and offered consultation for a revision. With its textbook initiative, Turkey proves that it is far from a European understanding of free speech, which is an essential property of European identity. But the European Charter also stresses the recognition and protection of minorities. What Turkey does is the opposite. By depicting Christian groups as traitors, it confronts their members with hatred and open attacks. State organizations and judicial systems have the obligation to promote an environment of free speech and dialogue between different groups and depict differences in ethnicity as richness in a human mosaic. 1 Editor's note: The number of Assyrians killed is very likely much higher. The Turkish genocide of Assyrians, Greeks and Armenians began on April 24, 1915. It is estimated that 750,000 Assyrians were killed (75%), 500,000 Greeks and 1.5 million Armenians. For more information on the genocide, see here and here.